Although this photograph was originally dated June 16, 1886 (shortly after the fire), information from a newspaper article, and from a dated billboard found in the background of the photograph, show that the portrait was likely staged in early September of 1886. Photograph shows City Council members and officials standing in front of a tent with the sign "City Hall", after the fire of 1886. The men in the photograph are: (seated, left to right) C.M. Coldwell, E.P. Hamilton, J.R. Northcote, Mayor M.A. 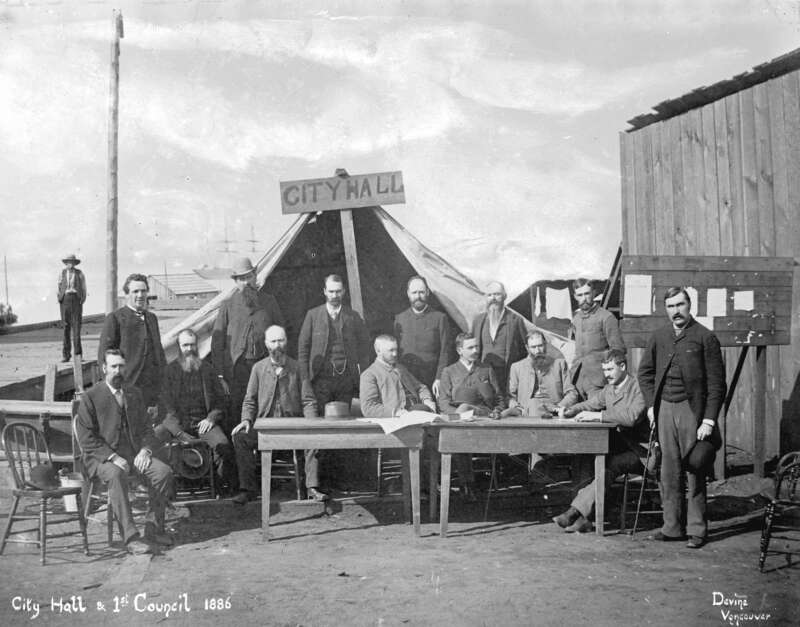 Maclean, L. A. Hamilton, P. Cordiner, City Clerk T.F. McGuigan; (standing, left to right) J. Griffith, R. Balfour, T. Dunn, City Solicitor J.J. Blake, J. Humphries, City Treasurer G.F. Baldwin, and City Coroner Dr. W.J. McGuigan. The empty chair on the left is for Councillor H. Hemlow, who was absent on business. The man standing on the wharf in the background is G.W. Gibson, founder of Gibson's Landing.